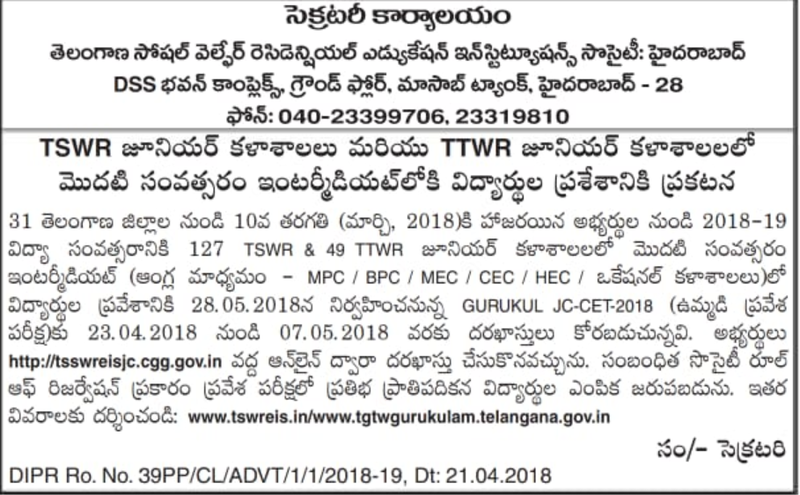 TSWREIS Application form 2020 for inter admission : Telangana Gurukul JC CET notification released and TS Gurukul CET application form has been released, available from 23rd April 2020. It is the examination to offer admission in 127 TSWREIS Jr colleges and 47 TTWREIS Jr colleges across the Telangana. TSWREIS Gurukulam Society conducts the TS Gurukul JC CET every year. Telangana Gurukul RJC CET (admission test) is a Telangana State level entrance exam. This exam is a gateway to get admission in Jr Intermediate courses in TSWREIS & TTWREIS for the academic year 2020-2021. TS Gurukulam Inter admission Online Application Form can be filled till 7th May 2020 without late fee. Applicants can check all the updates regarding TS Gurukulam JC CET 2020 including exam pattern, important dates, syllabus, application form, hall ticket, results, counselling dates etc. from our website. Candidates seeking admission into Intermediate I year have to apply only for one Society i.e. either to TSWREI Society (OR) TTWREI Society Junior Colleges for the academic year 2020-21 for Telangana GURUKUL JC CET 2020 through online by visiting www.tswreis.in. b) Must have passed the qualifying examination in first attempt in March, 2020 as regular candidate. Candidates who have passed in earlier years are not eligible and need not apply. Steps to be followed in submission of the TS Gurukulam Inter admission application form 2018-2019 through ‘Online’. i. The candidate shall first go through the information bulletin carefully and satisfy their eligibility for appearing for GURUKUL JC-CET 2020.
ii. The candidate after satisfying himself/ herself about the eligibility criteria for the submission of application through online should pay a fee of Rs.100/- through ONLINE or through Credit card (Payment gateway ) from 23.04.2020 to 07.05.2020 for submission of application through Online. iii. While filling the PAYMENT GATEWAY FORM (By Credit Card/Debit Card) the candidate has to give the required preliminary data (i.e. Name of the candidate, Date of birth and mobile number, Caste etc.). iv. On receipt of fee at ONLINE or PAYMENT GATEWAY, the candidate shall be issued a Journal Number with which she/ he can proceed with submission of application through online through the website www.tswreis.in Issue of Journal Number does not mean that the candidate has completed submission of application online. It is only a confirmation of the fee received. v. Before submission of the online application form, the candidate has to fill up the Model Application form (given at annexure) to avoid mistake. vi. Candidate who have appeared for SSC Board Examinations 2020 have to enter the hall ticket Number while filling the online application. Once Hall Ticket number is entered, certain data and photo of the candidate will be captured online. If the Data is not available in SSC Board the remaining data shall be entered by the candidate. In case of CBSE, ICSE candidate, candidates haves to fill the full data as per requirement of application. vii. The applicants (other than SSC Board) shall follow the procedure for submission of online application as given in the ‘Information Bulletin’ and also as per the instructions provided online while filling up the online application form. The Candidate should be ready with photograph of size 3.5 X 4.5 cms which is less than 50 KB. Before filling in on-line application. The Photo & signature should be scanned and uploaded along with the application form (other than SSC Board). viii. The applicants may not posses any certificate at the time of application, but they must obtain original certificates (Caste, Income, Study, Special category) by the time of counselling. ix. On submission of application through ONLINE, the candidate has to take a copy (print) of application form in which a reference number is given. This Reference number is required to download the Hall Ticket. The copy of online application is to be preserved for further reference. x. For any mistakes/ incorrect information, the candidate is solely held responsible. Hence, they must take utmost care while filling the online application. xi. The Applications of the ineligible candidates will be summarily rejected. xii. The selected Candidate must produce the original certificates mentioned in the application at the time of admission. xiii. The selection of the candidate will be summarily rejected if they fail to submit the necessary documents along with pass percentage of SSC/Equivalent qualification certificate at the time of admission.